The ITSC-AR404025F is a tower-based structure with a curved roof. 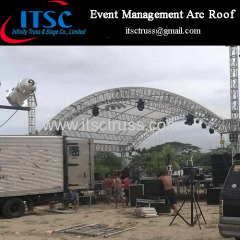 It is based on the 4-tower structure plat roof, which can be transformed into different roofing simply by adding a different set of roof structure.All the trusses sections are with 390x390mm pin truss, very quick to install for your rental business.The whole roof is mounted to the towers with special corners. 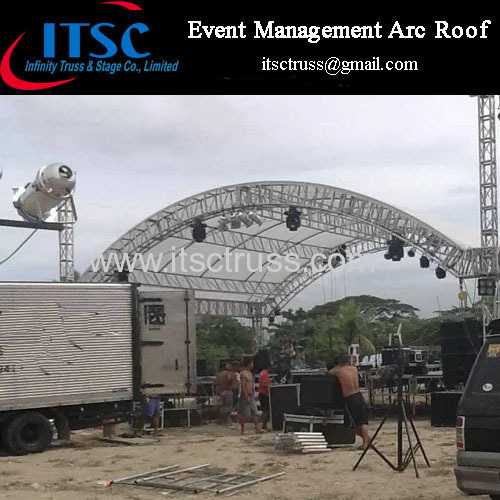 The arc truss sections usually cost more than the straignt ones due to the hardwork. Good use for permanently fixed project but not so popular for rental business. Quotation: CIF/FOB/EXW quotation is available.